My word! Look at that bird! I never knew birds could be so entertaining. But you will be sure to be entertained if you read the book I’m reviewing today! 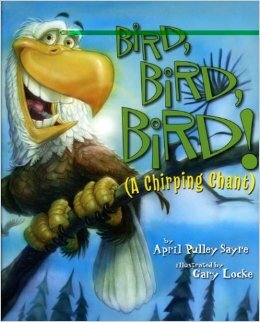 Synopsis: Sixty-three North American birds flit, fly, and dive across the pages of this cheery chirping chant. Bird, Bird, Bird! Is the third book in NorthWord’s famous chant series—all known for tongue-twisting, silly-sounding, say-it-faster fun! Zany caricatures of each bird present these feathered-friends in larger-than-life proportions. (You won’t need your binoculars here!) After readers have mastered the chant, they can turn to the back to get the real scoop on each bird. Sayre takes bird watching to a whole new level! Why I Like This Book: This book is a blast to read aloud. It is entertaining and informative. The artwork features caricatures of each bird that resemble the real birds but have been adorned with human-like accessories and features. For instance, the kingbird is wearing a majorly bejeweled crown. The kingfisher’s crown isn’t quite so big or bejeweled but you oughta see the size of his fishing pole! And the loons definitely look like they just came from the loony bin! So the delightful text matched with the amazingly fun illustrations kept me smiling and turning pages. Resources: The back of the book features facts on the birds. You will find plenty of ideas for activities by using the English/Language Arts and Science Standards that I found HERE on April Pulley Sayer’s site.